Despite it's ever rising costs, congestion and now politics between the organisers and the so called "Big 5" IOG Saltex remains an essential marketplace for Terrain Aeration to display it's new wares. So Ransomes Jacobsen cannot afford to have their enormous stand, the biggest on site every year, well, they could just have scaled down the stand rather than opting to appear only every other year. Some may question the increasingly wide range of products on display even likening Saltex to a large County show but there is still a core of attractive stands appealing to the IOG core audience who are Terrain's principal customers. This exhibition is always preceeded by weeks of angst and expense for exhibitors, such is the nature of exhibitions world wide, but as a place to show off new developments and launch machinery within the industry, Saltex is unsurpassed. 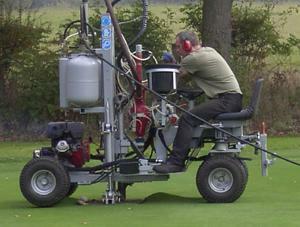 This year at Saltex Terrain Aeration launched Airforce Scamper and we simply have not stopped work since. Starting with the repair of the Course crossings at Windsor,Airforce Scamper has been on a breathless tour of the country dealing with Golf Courses, Botanical gardens and compacted soil in the UK and Eire. 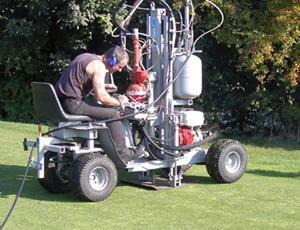 Airforce Scamper has proved to be the most successful new machine Terrain Aeration have ever made and combined with our own design compressor system it has proved reliable, tough and capable. So we look forward to seeing you all again at Saltex in 2006 (Big 5 excepted of course).